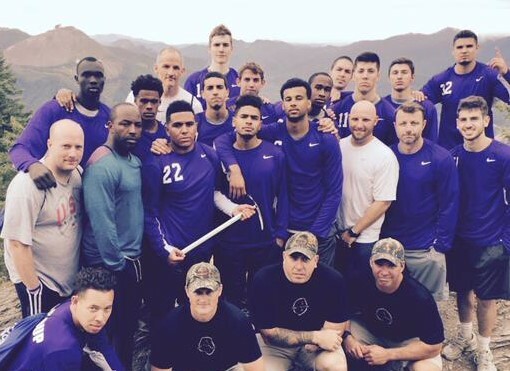 Team building and leadership development going on in the mountains this weekend....no more time for recruiting. First, welcome back, MP1......I hope we'll see contributions and opinions from you in the coming season. Regarding, KK, I asked the same question when I saw the picture, where is he? I thought for sure he'd be out there with the team....and you know what, looking at his job description, I bet he was the one who took the picture. So if that's Jazz holding the...whatever that is, a pick axe? And I'm guessing Rashad between Rev and Jazz. Who is lower left in the photo, and who's between Jarrel and Colin Russell? Lower left is the new assistant coach. Not sure about the guy in the back. NoPoNeighbor wrote: Lower left is the new assistant coach. Not sure about the guy in the back. Hahaha, yes, that is Coach Mitch Johnson front and left in the picture. The "guy" in the back is one of only two seniors on the team, Max Livingston.....with his summer haircut. You didn't recognize Max, but you recognized walk-on Xavier Hallinan on the far right in the center row next to Coach Pfaff? Well, just so you know, our DBO does get out of the office from time-to-time. The 3 players missing from this picture are Max, Jarrel, and Bryce. DoubleDipper wrote: You didn't recognize Max, but you recognized walk-on Xavier Hallinan on the far right in the center row next to Coach Pfaff? I'll be honest, I thought the guy at lower left was a player and the one beside Pfaff was maybe the new assistant. Coach Johnson looks like he could have just finished up his first year at college. Black Diamond Raven ice axe. Maybe they were preparing for some glacier travel?